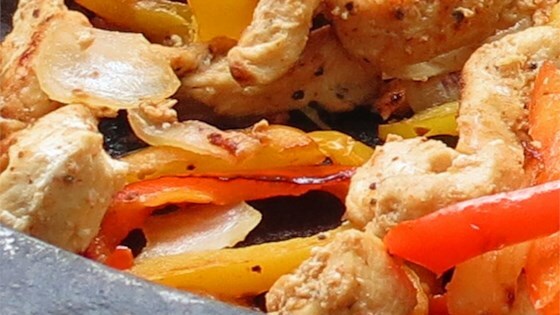 "This is a great basic fajita recipe which can be tweaked to accommodate the whole family. Add some black beans or Spanish rice. Easy to spice up or down. Top each serving with a sprinkle of fresh cilantro and spoonfuls of sour cream, taco sauce, and guacamole." Place chicken strips in a bowl and stir in lime juice, cumin, paprika, chili powder, cayenne pepper, and black pepper; marinate chicken for 15 to 30 minutes. Heat a large skillet or wok over medium heat and pour in olive oil. Cook and stir red bell pepper and onion in the hot oil until softened, about 5 minutes; move vegetables to the outer edge of the skillet. Place chicken strips with marinade in the center of the skillet and cook and stir until chicken is no longer pink in the center and juices run clear, about 3 minutes; cook and stir chicken and vegetables together until liquid in skillet has evaporated, about 2 more minutes. Set chicken and vegetables aside. Place corn tortillas on a microwave-safe plate with damp paper towels separating each tortilla. Cook in microwave until tortillas are hot and flexible, about 30 seconds. Place corn tortillas onto 4 serving plates; spread each tortilla with 1 tablespoon sour cream. Top each tortilla with 1/4 of the chicken and vegetable mixture; sprinkle with 2 tablespoons shredded Cheddar-Monterey Jack cheese blend. Sprinkle each tortilla with 1/4 cup lettuce and 2 tablespoons diced tomato. Top with any other desired toppings; repeat with remaining tortillas and ingredients. We liked it, but we didn't love it. I let it marinate overnight, so I was expecting big flavor and it just wasn't there. It was definitely quick and easy, but I doubt I will make it again. Love this- it's a staple. Very good and easy to fix for a quick dinner provided you do the prep work ahead of time. It even pleased both of my picky sons! I will definitely make this again. I ended up cutting these in thicker strips because I was grilling them. After grilling I cut them thinner. They were very good & enjoyed by all of us.